So asks Thomas Schweich, for years the lead US official on counter-narcotics in Afghanistan, and answers not so favorably for either the US or the Afghan governments. As close to the horse’s mouth as you would get it on CN policy. A definite must-read for those interested in the subject, and a piece that is sure to raise eyebrows -or hell- both in DC and Kabul. 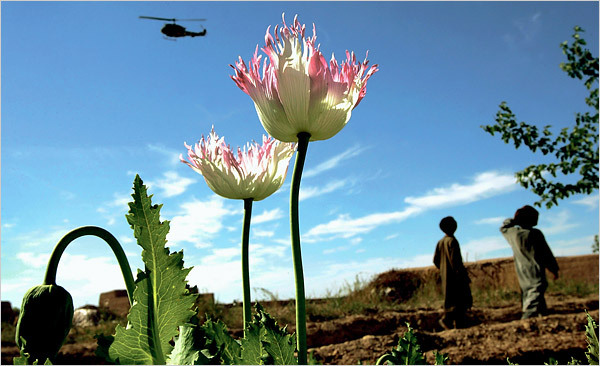 This entry was posted on Thursday, July 24th, 2008 at 3:02 am and is filed under Afghanistan, Aid Effectiveness, Book/Report/Media/Blog, Corruption, Drugs/Corruption, Politics. You can follow any responses to this entry through the RSS 2.0 feed. You can leave a response, or trackback from your own site. I’m just impressive about this picture. what’s the flower kind?I can see not only gentle but also imposing beauty of this flower.